I'm a goal setter and list maker. I used to make goal lists for my gaming hobby. When I started trying to get back into it a year ago, I didn't do anything formal. 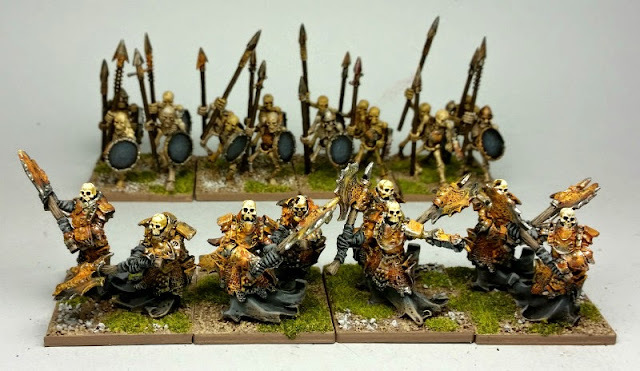 On the positive side of 2015, I've traded, bartered, and spent a very limited budget on putting together a decent undead army to pair up against my existing Marienburg army. And although I have made some sacrifices in quality & detail, I have managed to get a considerable portion of it painted up. I have also put together a simple gaming table and some new terrain. I've also painted a few things for other people, as commissions or in trade for figures. I've also drawn up some outlines for a campaign (forces, scenarios, rules, etc.) I'm also happy to have finally married my URL (and Google+ !) to this blog, as well as coming up with the goofy Althammer and LAWG ideas. On the negative side, the only way I got my own stuff painted was by sacrificing quality and detail, and frequently doing it in brief bits whenever I could steal away some time. I didn't do any of the sculpting I wanted to do, and I haven't played a single game. Although I am trying to be enthusiastic about the possibilities of solo gaming, I really miss playing games against actual people. (Really, I miss having any sort of a social life at all.) I've also ended the year on a bitter note, getting almost no time at the painting table in the final two months of the year. To be honest, looking at what little free time/money I have had, I'm feeling a little guilty about spending it on something that really seems like a lost cause that I am clinging to in desperation. So my plans for 2016? I'm going to try to keep that fluid & without expectations. I'd still like to play a game. I'd still like to paint a bit more of the undead, as I had hoped to do the last few months. I'd like to paint some non-undead stuff. That's about as far as I'm going to consider it. 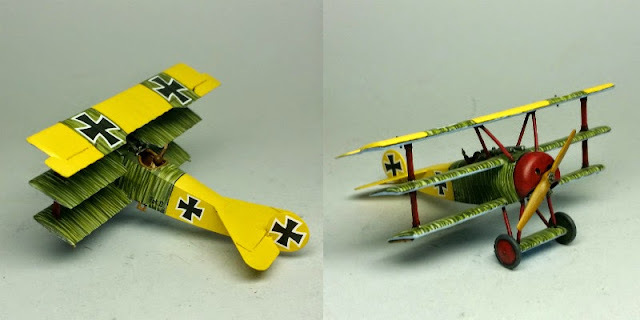 I was glad to finally paint and return Lothar's DRI to a friend, and was really happy with the way it turned out. A very nice looking plane. After looking all over for a perfect match for my idea of a unit of elite, heavy, skeletal troops, I settled on minor conversions on some Bane Thralls. After finishing them I am VERY happy with how they turned out, and although they still don't match the image originally in my head, I am really fond of these so that's OK. In fact, I would love to get my hands on another box for a second unit. Westfalia Fantasy Battles started a "halfmen" range and Kickstarter, and I really love the figures. I enjoyed painting the sample figures above quite a bit. 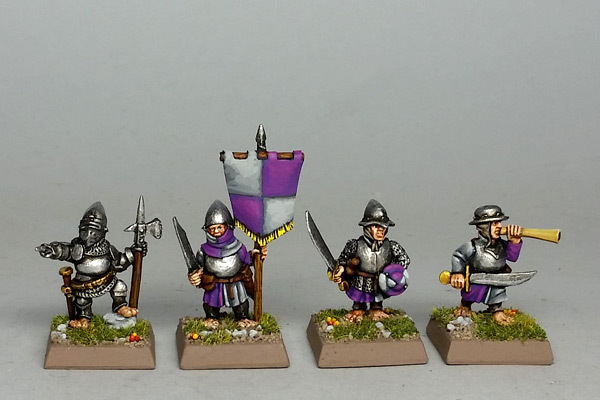 So, out of the blue and at the very least, I'd like to add a halfling division/contingent to the good guys/Marienburg forces. I stripped and two old '80s jabberwocks and repainted them in my "undeadish" pallette, with just a bit of color added in. 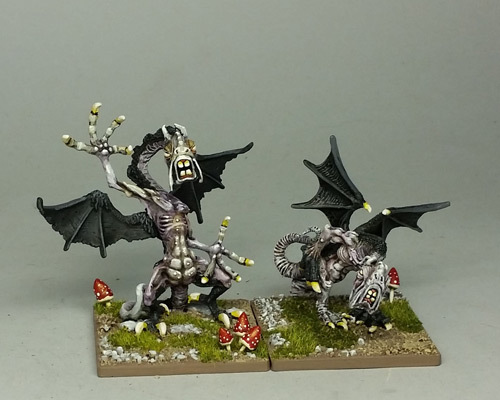 They turned out surprisingly nice, and after unexpectedly managing to get my hands on the metal version of Reaper's jabberwock, I'm looking forward to painting that much larger one in 2016.